Pork | Eat Meat. Drink Water. Some people seem to have trouble with pork. The most common symptoms are fatigue, inflammation, and – most interestingly – high blood sugar in both diabetics and non-diabetics. When I eat fresh pork, my blood sugar increases to between 120-150 and stays there for a very long time, and I am not diabetic. When I eat lamb, however, my blood sugar levels are between 96-113. For more detail please read my post Lamb is My New Best Friend. Several Type 2 diabetics in the group Principia Carnivora, have reported blood sugars numbers as high as 175 after eating fresh pork and high fasting blood sugars the day after eating it. Aged pork products like bacon and prosciutto, however, do not seem to have the same effect. An interesting study by the Weston A. Price Foundation may shed some light on this conundrum. “Three adults, including two females aged thirty-seven and sixty, and one male aged fifty two, participated in the study… Subjects each came to the laboratory once weekly for five weeks at the same time of day by individual appointment. On the days in which they participated, subjects were required to fast for at least five hours. A baseline blood test was first done. Each subject was then given a measured amount of meat to consume, at least three ounces. The meats (1), (2) and (5) were cooked over low heat in a cast iron skillet for up to one hour, with a little water but no added fat, and salted to taste. The cooked meats were prepared well done. The bacon was cooked until slightly stiff, but not crisp or dry. The prosciutto was consumed from the package without any preparation. 1. Consuming unmarinated, cooked pastured pork produces blood coagulation and clotting in blood examined at five hours after eating; however, consuming marinated, cooked pork does not produce any blood coagulation or clotting. 2. Consuming processed forms of pastured uncured pork, including bacon and prosciutto, does not produce any blood coagulation or other visible changes in the blood at five hours after eating. 3. Consuming unmarinated, cooked pastured lamb does not produce any blood coagulation or other visible changes in the blood at five hours after eating. For more details, please see their article: How Does Pork Prepared in Various Ways Affect the Blood? Although WAPF, does not have any idea what the “toxin” in unmarinated or unaged pork might be, Dr. Peter D’Adamo’s work into how food lectins affect different blood types might offer an intriguing possibility. Apparently, pork contains a lectin that will glom all blood types in vitro. In other words, if a drop of this lectin is injected into your blood stream, your blood will agglutinate and you will die. The premise of D’Adamo’s dietary recommendations is that we should avoid foods that contain lectins that are known to agglutinate our particular blood type. D’Adamo found in his practice that if people avoid foods containing the lectins that will agglutinate their blood, their health will often improve. It is certainly possible that people could absorb some of these food lectins intact and that this could negatively affect their blood quality – not to the point of actually killing them as would injecting the lectins directly into their blood stream, but enough to overtax their immune system and cause them to become ill with any number of chronic or autoimmune illnesses. It is possible that when pork is marinated in vinegar or aged in salt, the lectin and/or antibody is somehow broken down or altered in such a way that it is no longer capable of agglutinating the blood. It is – of course – pure speculation on my part, but the most plausible idea I have come across so far. D’Adamo classes bacon and fresh pork together, but I have no way of determining if the lectin was actually found in both types of pork products, or if he is just assuming it is in bacon because it is in fresh pork. It is also interesting to note that Dr. H. L. Newbold – who prescribed an All-Meat diet in his medical practice – found that most of his patients reacted very poorly to pork. He only had a handful of patients who felt good after eating pork, and – in a strange twist of irony – one of these patients was Jewish! The meat that Dr. Newbold found to be the most universally beneficial was beef. Similarly, Dr. J. H. Salisbury, a prominent physician in the mid-1800s – who developed what became known as the Salisbury Cure – found that pork was a sub-optimal meat. Dr. Salisbury was a pioneer in using food to heal disease. He developed his diet by living on one food at a time for days, weeks, or months. He tested foods in this way to see how they affected his body. After many years of experimentation, he came to the conclusion that beef was the best food for mankind. Runner-up was lamb. A variety of other meats were considered okay if beef and lamb were unavailable, but he specifically discouraged his patients from eating pork. So, if you are trying a Zero Carb diet and feeling tired, inflamed, or experiencing higher than average blood sugars, you may want to consider removing pork from your diet for a while and see if you feel better without it. Thank you Esmée! This article is exactly what we needed at the perfect time too. It always seems that when we come up with a problem doing Zero Carb, you have already have discovered the answer. Thanks again! I’m really concerned about a two things, 1. You say you’re not diabetic but the blood glucose readings you cite are really high, what are your fasting numbers? 2. The number of people in the Weston Price study is so few that the results are absolutely meaningless. Is there any real science that supports pork as an issue? Bill – I don’t know of any study that has been done on a significant group of people to see how pork affects them. I was just trying to figure out why Myself and several others might be experiencing these higher blood sugar numbers after eating pork. The mini-WAPF study and Dr. D’Adamo’s lectin and antibody info are the only things I could find that might explain it. I also find it extremely interesting that both Dr. Salisbury and Dr. Newbold found pork to be less than optimal for their patients. I am simply sharing my journey. When I eat pork, my fasting numbers are above 120 and can go as high as 150. When I eat lamb, my fasting numbers are below 110 which is fine on a low-to-no carb diet. Your response to pork may be completely different than mine. And remember,this is fresh pork I am talking about, I do not eat marinated or aged meats. A member of Principia Carnivora who is a Type 2 diabetic get high blood sugar on from fresh pork, not bacon and the like. The only way to tell if this is true for you is to test yourself. The best way to find out if you are sensitive to any food is to not eat it for a while and then add it back and see how it makes you feel. excellent and useful summary of a very little known subject. I feelthat your “speculations” are spot on. I have the same elevated FBG when I eat either pork or too much protein at night. if i stop both factors,, it drops below 100 in two days. .
Consuming unmarinated, cooked pastured pork produces blood coagulation and clotting in blood examined at five hours after eating; however, consuming marinated, cooked pork does not produce any blood coagulation or clotting. Taking a cue from the pic at the top of this post, may i be so bold to suggest a Vitamin K component? 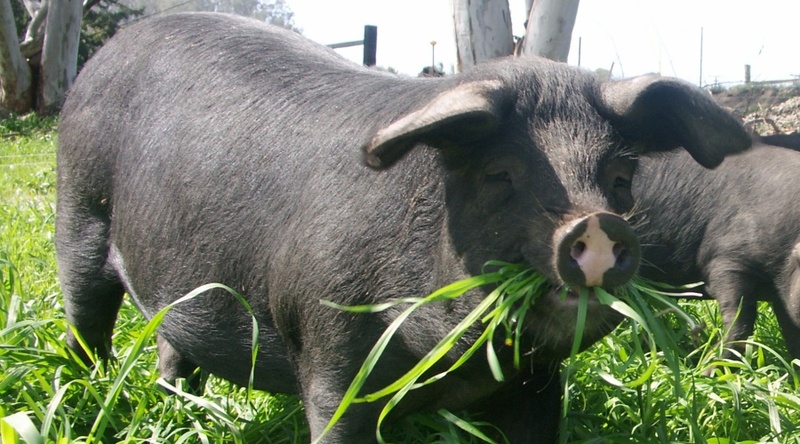 If the pigs are eating lots of grass (as in the pic), then the Vitamin K they are getting from the grass is getting stored in their meat…and then WE come along to consume it, and guess what? Possible Vitamin K overdose! Also, I recently learned about the effects of vinegar on blood sugar through Dr. Jason Fung’s website–vinegar and dill both work to LOWER blood sugar, both independently and together. So diabetics, listen up–marinate your pork in vinegar before cooking, and have a dill pickle with your pork!! Hubby and I have been going through dill pickles like you wouldn’t believe, because they’re cheaper than insulin, and THEY WORK. Even the juice by itself works. The pork that I ate was not grass-fed, and it is possible that grass-fed or pasture-raised pork would not raise blood sugar like the commercial stuff does for me. The dill pickle thing is fascinating! Thank you for sharing. Why not combine the two? Start marinating your pork in dill pickle juice. I’m going to give it a try, even though pastured pork is the only meat that doesn’t send us soaring–the higher the fat content, the better we do. Hubby hates the taste of lamb, otherwise it would be our best friend too. I sneak it into meatloaves and stuff by mixing it with sausage or chorizo. My meaty friend–I just got back from an appointment with my rheumatologist, who started to give me the rundown about arthritis and gluten (with which I was already familiar), and that got me thinking about your case. Gluten is the short way of saying agglutination, and gluten comes from grains. By any chance, do you know if the test subjects were fed grain-fed meats? If so, the grain feeding would explain the blood agglutination…I think (coming from an arthritis angle). Cross-contamination of offending proteins often happens when you have manufacturing plants processing more than one kind of food without cleaning the machinery between runs (example: grains and dry beans–if you look closely enough on the packaging, you’ll find a message that says “processed in a facility that also handles like soy, corn, or dairy. The doc I saw today (not my normal doc) was duly impressed with my knowledge about arthritis and food, how nutrition affects everything in our bodies, and was surprised to see a spry-looking, apparently mostly healthy 53-year-old (who has no need of hair dye…YET). They asked me how long I had the arthritis, and I said, “since I was three.” No pain, very low CRP, no crutches or other medical devices needed for walking. They asked me what meds I was taking (referring to biologics), and I said none to date. Yeah, I got joint damage, and one day I’m gonna need a new shoulder and maybe some new knees, possibly a new right hip, but they don’t bother me now. I strongly suspect the meat used in the study was grain fed. I certaily know people who react to meat fed grains, but I have celiac and I do not. However, pork itself has a lectin in its tissue that is also an agglutinin, and I believe this is why I personally react to pork. Red meat has no lectins and I think this is why most people seem to feel best on beef and lamb. Why wouldn’t we get this response to beef then? Cows eat a heck of a lot more grass than pigs do. I believe it is due to the lectin that pork contains. Beef has no lectins. I’d like to know more about this dill pickle thing. I know on ZC we are supposed to only eat from the animal kingdom but am still interested in this theory. I am in the UK and I *think* our dill pickles are in a juice with sugar in the jar? Is it the same in other countries? In the US, we have sweet pickles and sour pickles (no sugar). But either way, pickles are not zero carb because they come from the plant kingdom. Zero carb is not so much about no carbs in the diet as it is about no plants in the diet. I eat fresh pork all the times. I put just a little but rub seasoning on it, put it in the oven and done. I like it better than beef for its tenderness. Never had any tireness or bloating or anything like that eating pork fresh from pig. Am I just different? Not everyone has trouble with pork. If it works for you, then that is awesome! Or Epic’s, https://epicbar.com/animal-oils-overview. I’ve been spreading their tallow (which looks almost like butter) on my ribeyes. I am not sure if it is a histamine issue or a digestive issue, or both. I wonder if these are the original reasons for the restrictions on eating pork (https://en.wikipedia.org/wiki/Religious_restrictions_on_the_consumption_of_pork). Not that the ancient people’s had the scientific knowledge but that they experienced the illnesses. Pigs can get trichinosis. People eating undercooked pork can get the disease. I’ve always guessed (nothing more scientific than that) that the religious restrictions on eating pork might have originated with the trichinosis problem. Highly probable in my opinion also. Today, with modern commercial pork production, there is virtually no danger from this parasite because all pigs are given medication that kills it on a regular basis. I’d love to read your article “Lamb is my new best friend”, but the link is broken. I’m sorry. After 3.5 years on ZC, I have come to the conclusion that the meat I feel truly good on is beef. Lamb makes me depressed and gives me migraines. I believe it is too high in histamines for me personally. However, I still think it is a terrific choice for people who are not histamine intolerant like me. The lamb ribs have a lot of fat, so I really wish I could eat them. Any red meat is a good choice. I was refreshing my understanding of histamines, and one of the things I remembered was that food that isn’t 100% fresh can be more of a problem. Is there any possibility that lamb from another source would work for you? I buy lamb from a farm in Wisconsin that’s beautifully processed and is always frozen solid when it comes to my door. If you’d like to try it, I can give you the web page. My first thought reading this was how often pork is smoked, or cooked in a bbq sauce that often has vinegar or other marination, and the way I usually eat it. Perhaps there’s some old underlying wisdom at work. I enjoy pork, but nothing truly satisfies me like beef.